A nonprofit in Clallam County. Our prime mission is to assist homeless veterans, veterans in need, and their immediate family members, in part through a Stand Down. According to the Veterans Administration data, there are over 15,000 veterans on the Olympic Peninsula. It's the highest per capita percentage of veterans in the Country. The need to help veterans is particularly great here. 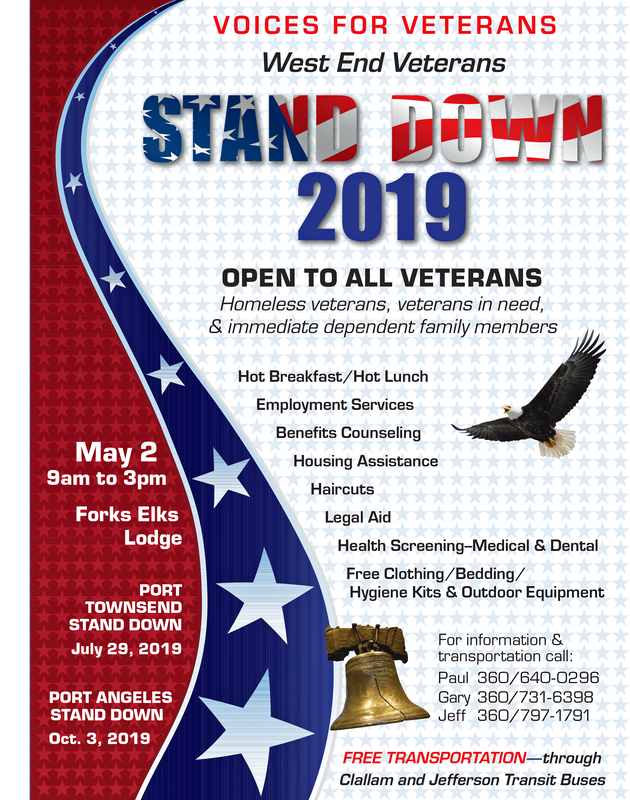 On the average, 13.5% of veterans who attend the stand down events are women, and 17.5% of veterans who attend these events are homeless, in which, 3.2% of those homeless are women . In total, 615 veterans were helped during the three Stand Down events in 2017 alone. 2018 Stand Down! Please visit our Stand Down Page for more information.